I guess it shouldn’t be a surprise that you changed your minds just a bit (again) Love you friend…glad you get the best of both worlds for awhile. I still can’t believe I didn’t dream last night! You are really here – for the whole winter!! (and maybe longer!!) Do you know how much more enjoyable life is when you are around? I feel abundantly blessed this morning! Off for a photoshoot at 4 with the Moores, so I’ll catch up with you tomorrow! I have to say that you are bringing back memories for me! I lived around Bozeman and the Big Sky area for a summer. I remember a place in big sky that served Huckleberry pancakes that I loved! Of course that was before I realized I should be eating gluten free! It such a beautiful area. I am sure you will enjoy making residence for awhile. I am also sure it was a hard decision. How do you heat the rv? Also the wedding photos are LOVELY and you looked very beautiful as well! Looks life is settling down for you. Are you planning on finding a place and selling the RV??? Are you going to homeschool Bella or will she go to school? Do you plan on working? I hope life finds it adventures for you wherever you go. I have certainly enjoyed your blog. I think it’s wonderful for you to settle for a bit…as much as I have always loved traveling, the soul seems to love some sameness and predictability and roots at times. Have fun reconnecting with your community there and best hugs and wishes to Matt’s sister with her new little one!!! I have been reading your blog off and on for a couple of months. The first time I read you had just drove through the UND campus, and that is where I live! I am from MT though, Polson actually. I love Bozeman and would love a chance to live there!! I am very thankful for all that you do, you are an inspiration to me!! Have a great time in Bozeman, I am very happy for you!! Oh you guys, that’s great. It’s good to be around family for a while, I’m sure missing mine, even if they are in stinky L.A. and not someplace cool like Bozeman. There’s nothing wrong with changing your mind. Don’t you just feel so fortunate to have the ability to do that? Options. That’s what this lifestyle gives you. That’s the best part of it. Good luck guys. We’ll see you again, I just know it. P.S. your sis’ wedding photos are AMAZING! I’m bummed I won’t be bumping into you next week at the Farmers Market but I’m so happy that you’ve decided to rest for a bit in a place so dear to both of you- especially with a new baby joining the family! Is this Bella’s first cousin?? Oh, I am so jealous (in a good way)! We left our hearts in Bozeman too. When dh is out of the AF in 9 years, we want to retire there. The co-op is the BEST! We also love the pottery shop/bakery as you head south on the Gal., just past the KOA. Enjoy your time settling down for a bit! Well it feels right that you guys are settling down for now—and what a place to do so. Love that you go with what feels right in the moment. Welcome home to Bozeman! I haven’t been to Montana in years, but I remember loving Bozeman. 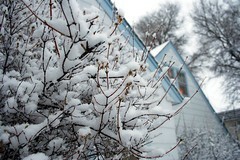 Enjoy your soup, coffee, thrifting, and snow, and we’ll enjoy hearing more blogging from you! How wonderful to be home again! My husband’s grandfather lives in Montana, about 2 hours from where you are, and we are talking about taking the trip out west in the spring. We just bought a pop-up and are going to be redoing the inside some… Glad you are happy and glad to have found your blog! Ah Bozeman! Yes. I love it there too. I spent a summer working for Gallatin National Forest as a Field Geologist, and loved it so much that I just stayed and worked at the Community Co-op. Well it is the best Co-op…and I was fullfilling a dream by working there too. Bozeman grabs your heart for sure. I live in San Francisco and now have the ‘real job’. Lets just say, San Francisco isn’t that bad either. So funny, cause I am from Iowa. Still kind of an Iowa Girl, but I like living out West. hi there! we had corresponded a while back- my husband’s the one with the skateboard ministry (middleman). i am so happy to find you again! i love reading about the adventure your family is on. it is great that you all are taking the time to hang- bozeman looks incredible! like a little austin (about 10 years ago) nestled in the mountains! perfect! First off LOVE to read of other rving homeschooling families. We too decided this route this past summer after a series of events in our lives not only this year but in the past few. Anyhow my husband is looking at being transferred an the KOA is a bit out there for pricing can you suggest the place you are staying? Once the season starts up again it isn’t as hard to find places but in MT it is getting thru the winter. We are in Helena currently in a year round rv park. We have a 29ft 5th wheel with one slideout so if that is of any help. Anyhow just found your blog tonight via another blog so thought it was worth a shot in contacting you. off to read more. Saw the article in the NYT. My husband and I full timed in a converted bus for a year and are now planning to sell our house to do so indefinitely. We’ve been very interested in biodiesel (already have solar panels on our roof), so will be following you with interest.